Flora Macdonald College in Red Springs originated in 1896 as Red Springs Seminary, a Presbyterian school that was the successor to Floral College (1841-78). In 1903 the college was renamed Southern Presbyterian College and Conservatory of Music, and in 1915 it became Flora MacDonald College-named for the popular Scottish heroine who lived in the Carolina colony for five years beginning in 1774. In 1952 the Presbyterian Synod of North Carolina authorized a study of seven of the Presbyterian colleges under its jurisdiction and decided to merge Flora Macdonald College with Peace and Presbyterian Junior College to form one coeducational, four-year college to be located at Laurinburg. Chartered in 1958, St. Andrews Presbyterian College opened in September 1961. On 26 Oct. 1961, the Flora MacDonald property was sold to the Red Springs Development Corporation for $50,000. William Richard Bracey, "A History of Flora MacDonald College" (M.A. thesis, Appalachian State University, 1962). William S. Powell, North Carolina: The Story of a Special Kind of Place (1987). Dorothy M. Quynn, "Flora MacDonald in History," NCHR 18 (1941). Flora Macdonald Academy. http://www.floramacdonald.org/ (accessed May 8, 2013). 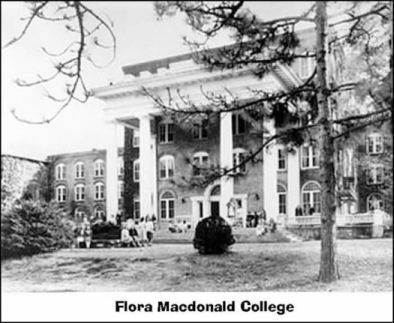 "Flora MacDonald College." Photo courtesy of the St. Andrews Presbyterian College website. Available from # (accessed May 2, 2012). Thank you for visiting NCpedia and taking time to share your question. The text of your post is included below. I have consulted two sources to consider the most accurate spelling of Flora Macdonald College. The second is the website for St. Andrews University in Laurinburg, NC. St. Andrews traces its history to Flora Macdonald College and its merger with Presbyterian Junior College in Maxton, N.C. The “History” page on the St. Andrews website spells the name as “Macdonald.” If you have additional questions, I might suggest the Detamble Library at St. Andrews -- https://www.sa.edu/detamble. Librarians should be able to help you more with the history of the school.